As I sat down to New Year’s Day lunch, I thought nothing could be better than this bowl of Laksa, a traditional Malaysian soup. It was brothy, light and spicy, packed with vegetables and thin noodles. Jim would have loved this; soup was one of his favorite things. Now I need soup that will nourish, warm and comfort me. With the joys and sorrows of 2016 still raw, we look for ways to go on. Perhaps it’s time for some lighter eating and living. Creamy or brothy, thick or thin, hot or cool, every culture and tradition has soup. Farm folks still put up Mason jars of vegetable soup from the summer garden bounty. Commercial factories fill grocery shelves with canned, dried and frozen soups. Delicious soup can be made even with a few vegetables and water. Fresh, preservative free soup will always be better. Why not make soup at home, even if you are in a hurry. The following recipe, a 15-minute wonder, is an adaption from Rosemary Kearney. It’s accessible to anyone who has a few vegetables plus some chilies in the fridge and a can of coconut milk in the pantry. ¼ cup grated carrot or slivered red pepper. 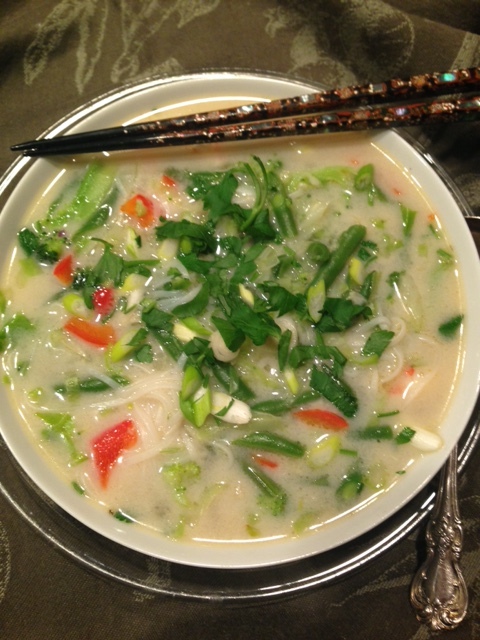 Place rice noodles in wide bowl; cover generously with boiling water; soak until soft. Drain and rinse. Or cook broken vermicelli according to directions, rinse and cool. Bash ginger, garlic and chili in a mortar with pinch of coarse salt to form an even mash. Or use a mini food processor or finely chop chili and grate ginger, garlic. Warm oils in soup pot. Add ginger paste stirring constantly a few seconds until the mixture smells, cooked. Add stock and simmer covered 5 minutes. Add coconut milk (less or more as preferred) and simmer 5 minutes. Season with fish sauce, salt if needed. When ready to serve, add vegetables, optional meats, noodles and heat. Add lime juice and immediately divide soup into bowls. Sprinkle with sliced green onions, plus cilantro if you have it. Serves 2 or 3. You are currently browsing the Mary Jo's Kitchen blog archives for January, 2017.